I am heading to North Greenland in 3 days time to work where temperatures will be close to -20 F. The ocean is covered by 3-4 feet of sea ice that is frozen to land. We will drill lots of ice holes to deploy ocean sensors that will connect via cables to weather stations and satellite phone. Fancy $20,000 GPS units will measure the tides across the fjord and provide a group of future Naval officers a reference for their fancy electronic gear to measure sea ice thickness remotely by walking and comparing results to those obtained from planes overhead. Cool and cold fun. There has been much packing and shipping the last weeks, about 2300 lbs to be precise,which made my body stiff and sore. Another way to hurt my aging body was to learn shotgun shooting for the unlikely polar bear encounter on the sea ice. My shoulder still hurts from the recoil blasts of the 12 gauge pump-action gun with 3” long cartridges that included a 1 oz. lead slug. I also tested a cot and sleeping bag that will be with me on the ice for emergencies. The night in my garden a few days ago was cozy, but the cot required an insulation mattress, as it was too close to the ground. It was rough sleeping, because of unexpected noises not cold, but I did sleep some and woke up when the sun came up. Cot, air mattress, and down sleeping bag testing in my garden after a rough night. Wolstenholme Fjord as seen by LandSat on Feb.-27, 2017. The line with the red dots extends from Thule pier seaward towards the north-west. Note the dark spot near the left-top corner that shows thin new ice or even open water. White contours are ocean depths in meters. This thin new ice is the limit of where I expect to be working. After measuring ice thickness directly via drilling through the ice, my first measurement will be that of how temperature and salinity varies from under the ice to the bottom of the ocean. Danish friends do this routinely about 60 miles to the north where they work out of the Inughuit community of Qaanaaq, but Inglefield Fjord is much deeper and connects to warm Atlantic waters from the south that, I believe, we do not have in Wolstenholme Fjord. Hence I expect much less heat inside Wolstenholme Fjord and perhaps a different response of three glaciers to ocean forcing. This theory does not help me much as I will have to lower instruments via rope and a winch into the water. How to attach rope to instruments and winch? Knots. Fancy knots on shackles in my home office … yes, Peter Freuchen is on the bookshelf, too. There are always devils in the many details of field work. Another worry is that my 10” ice-drill is powered by 1 lbs bottles of propane. It is not possible to send these camping propane canisters via air, but larger 20 lbs tanks exist in Thule for grill cooking at the NSF dormitory where I will be staying. So I also will have to learn how to fill the smaller container from the large one. Just ordered another adaptor from Amazon to travel with me on my body to do this. I am both terribly nervous and excited about the next 6 weeks. This is my first time working on the ice, because before I have always been on icebreakers in summer. These past Arctic summer expeditions on ships created an unreal and distant connection that, I hope, will be shattered by this spring. I will get closer to the cold and icy seas that are my passion. Oceanography by walking on water … ice. I am a self-taught amateur on remote sensing, but it tickled my pride when a friend at NASA asked me, if I could tell a friend of his at NOAA on how I got my hands on data to produce maps of radar backscatter to describe how the sea ice near Thule Air Base, Greenland changes in time and space. In about 4 weeks from today I will be working along a line near the red dots A, B, and C which are tentative locations to place ocean sensors below the sea ice after drilling through it with ice fishing gear. The colored line is the bottom depth as it was measured by the USCG Healy in 2003 when I was in Thule for the first time. Faint bottom contours are shown in gray. Screenshot on how I search for the Sentinel-1 SAR-C DATA. where one also finds wonderful instructional videos on how to work the software. The data file(s) for a typical scene are usually ~800 MB, however, for processing I use the free SNAP software (provided by European Space Agency) via a sequence of steps that result in a geotiff file of about 7 MB. Screenshot of SNAP software and processing with  input and  output of the Feb.-5, 2017 data from Wolstenholme Fjord. This .tiff file I then read with Fortran codes to tailor my own (quantitative or analyses) purposes. Start of Fortran code to covert the SNAP output geotiff file into an ascii file with latitude, longitude, and backscatter as columns. The code has 143lines plus 80 lines of comment. The final mapping is done with GMT – General Mapping Tools which I use for almost all my scientific graphing, mapping, and publications. Please note that I am neither a remote sensing nor a sea-ice expert, but consider myself an observational physical oceanographer who loves his Unix on a MacBook Pro. If only my next problem, working in polar bear country with guns for protection, had as easy a solution. Optical satellite image of Wolstenholme Fjord, Greenland on March-21, 2016 with Thule Air Base in bottom right. Darker areas show thin ice. Wolstenholme Fjord, Greenland Jan.-03, 2017 from Sentinel-1 radar. Wolstenholme Fjord, Greenland Jan.-24, 2017 from Sentinel-1 radar. Wolstenholme Fjord, Greenland Jan.-28, 2017 from Sentinel-1 radar. The lighter white tones indicate that lots of radar signals return to the satellite. The many tiny white specks to the south of the Manson Islands are grounded icebergs. The different shades of gray indicate different types of ice and snow. The Jan.-24 and Jan.-28 images show a clear boundary near longitude of -70 degrees to the north of the island (Saunders Island) that separates land-fast ice to the east from thinner and mobile ice in Baffin Bay to the west. Wolstenholme Fjord on Aug.-27, 2016. The view to the west with Mount Dundas on the left (south) and southern part of Saunders Island on the right (north). Wolstenholme Fjord on Aug.-27, 2016. The view to the west with the northern part of Saunders Island on the left (south) and smaller Manson Islands on the right (north) next to then northern shore of the fjord. I plan to work from Thule Air Base (red dot bottom right) out along points C, B, towards A. The color of line near these points is a section where I have very accurate bottom depth from a 2003 US Coast Guard Icebreaker that was dropping off scientists at Thule on August 15, 2003. 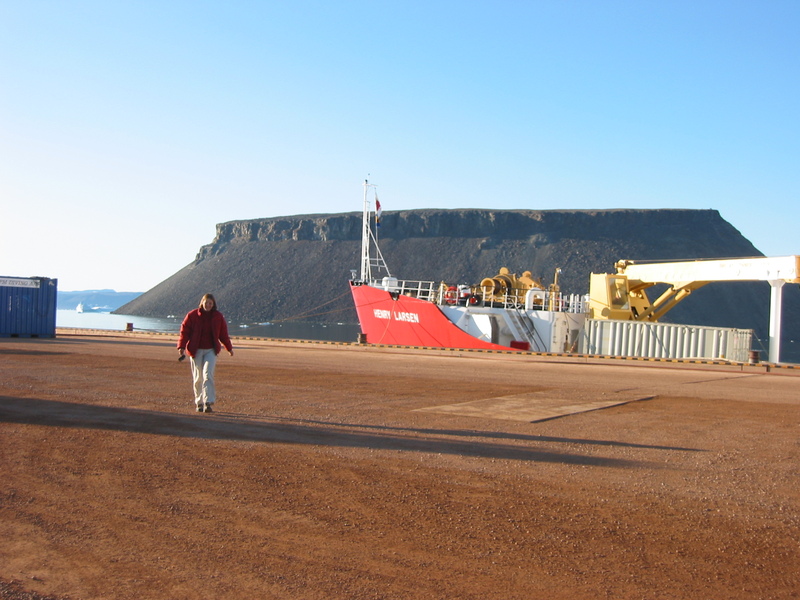 I was then one of the scientist dropped off after a 3 week excursion into Nares Strait and Petermann Fjord. Along this section I hope to test and deploy and under-water acoustic network that can send data via whispers from C to A via B. First, however, we will need to know how sound moves along this track and before that, for my ice safety plan, I will need to know how thick or thin the ice is. The imagery does not tell me ice thickness. Flying to Thule Greenland with US Air force Air Mobility Command delivering cargo and people. Arriving in Thule on Mar.-8, we will first need to measure ice thickness along this A-B-C section with a sharp ice-cutting Kovacs drill and a tape measure. The US National Snow and Ice Data Center (NSIDC) distributes a “Handbook for community-based sea ice monitoring” that we will follow closely. This first ice survey will also give us a feel and visual on how the radar satellite imagery displays a range of ice and snow surfaces. One of my PhD students, Pat Ryan, will process and send us the ESA Sentinel-1 radar data while a small University of Delaware and Woods Hole Oceanographic Institution group will work on the ice in early April. P.S. : If possible, I would very much like to work with a local person who knows sea ice and wild life that we would need protection from. Danish contacts are reaching out on my behalf to people they know in Siorapaluk, Qaanaaq, and Savissivik. 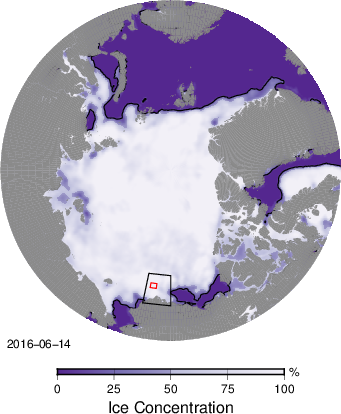 Ice concentration for June 14, 2016 from SSM/I imagery. Insert show study area to the north of Alaska and planned mooring locations (red box). 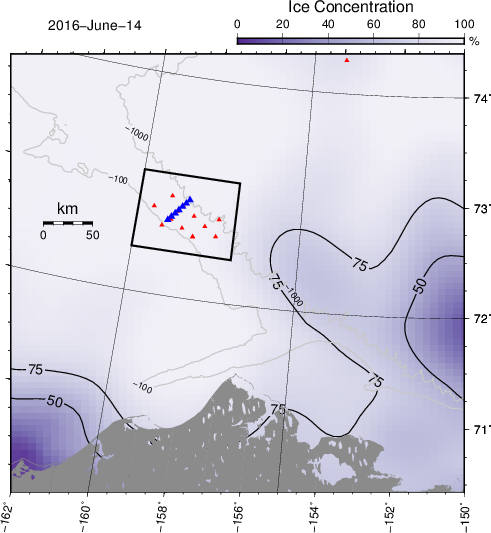 Ice concentrations from SSM/I to the north of norther Alaska with planned mooring locations across the sloping bottom. The 100 and 1000 meter contours are shown in gray with blue and red symbols representing locations of ocean and acoustic sensors, respectively. My responsibilities in this US Navy-funded project are the seven densely packed blue triangles. They indicate locations where I hope to measure continuously for a year ocean temperature, salinity, and pressure from which to construct sections of speed of sound and how it varies in time and space. I will also measure ice draft as well ice and ocean currents from which to estimate the roughness of the sea ice over time. Sea ice and ocean properties both impact sound propagation from deep to shallow water and vice versa. A first question: What will the ice be like when we get there? This is the question that has the 40 or so people all working on this project anxiously preparing for the worst, but how can we expect what challenges are to come our way? along with fancy and free Fortran and General Mapping Tools to make the maps shown above. With these tools and data I can then calculate how much sea ice covers any area at any time. The result for custom-made mooring area at almost daily resolution gives a quick visual that I use to prepare for our fall 2016 expedition. The dotted lines in the top panel indicate the dates we are in the area. 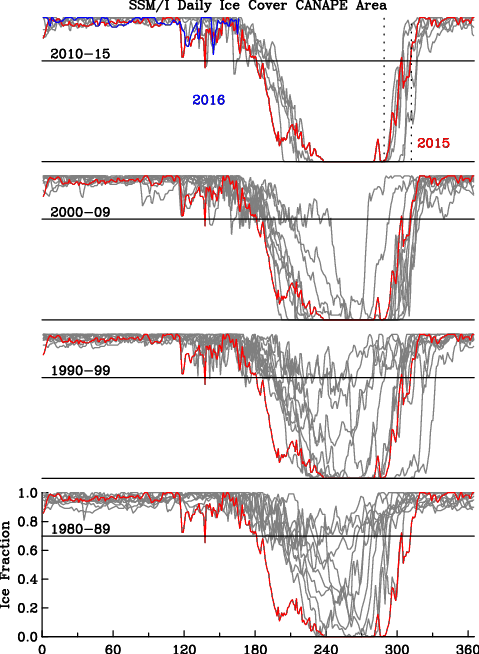 Time series of daily ice concentration in the study area for different decades from January-1 through Dec.-31 for each year from 1980 through 2015. Panels are sorted by decade. The red curve is for 2015 and is shown for comparison in all panels. Weather will be most uncomfortable, because fall is the Pacific storm season. 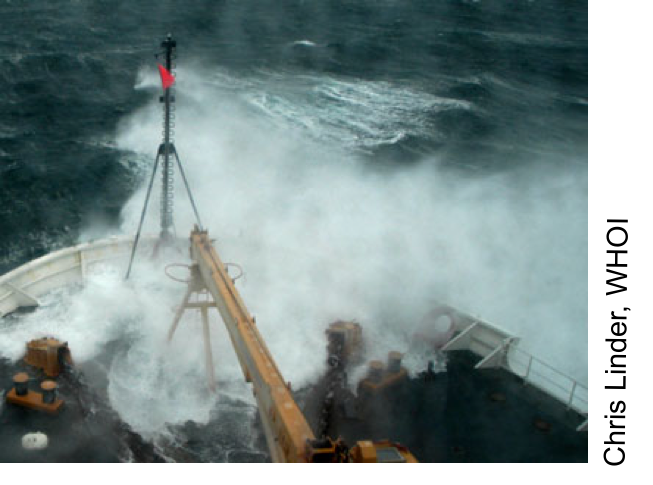 And with little or only thin ice, there will be lots and lots of waves with the ship pitching and rolling and seeking shelter that will challenge us from getting all the work done even with 7 days for bad weather built into our schedule. Oh, I now also recall that during this four-week expedition we never saw land or the sun. It was always a drizzly gray ocean on a gray horizon. The Arctic Ocean in the fall is an often cruel and inhospitable place with driving freezing rain and fog. The eagle “sees” the ground, because the twinkling sensation of light tickles her nerves. Today’s cameras work without the twinkle and tickle. They store numbers (digits) that approximate the amount of light passing through the lens. Satellite sensors work the same way. The data they beam to earth give me the soaring feeling of flying like an eagle, but there is more to the bits and bytes and digits sent home from space to our iPhones, laptops, and the internet. 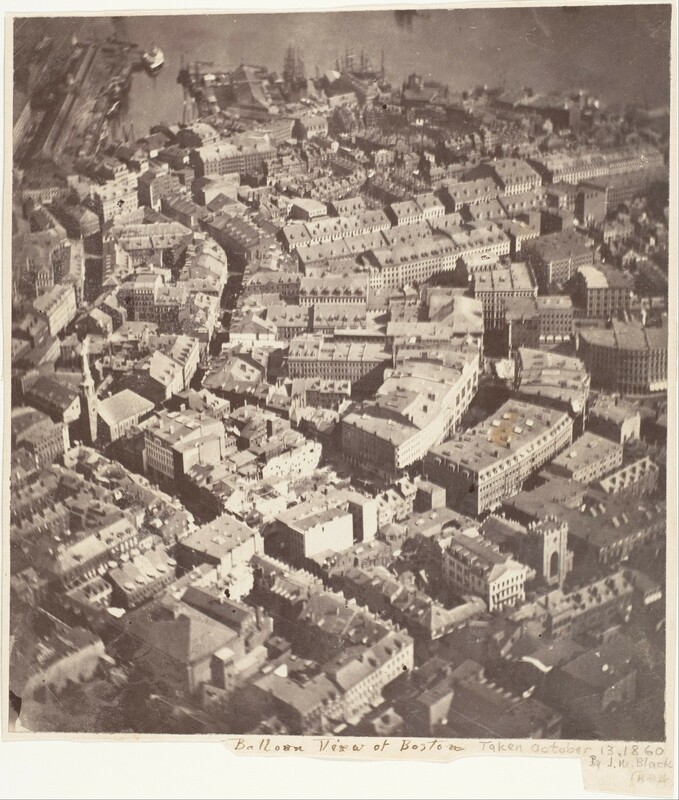 Aerial photo taken Oct.-13, 1860 Boston, MA from a balloon by J.W. Black. The Metropolitan Museum of Art in New York houses the earliest existing aerial photo that was taken from a balloon hovering 600 meters above Boston, Massachusetts. Within a year the American Civil War broke out and this new technology became an experimental tool of war. It advanced rapidly, when air craft replaced the balloon during the First World War. Sharp photos of bombed-out battle and killing fields along the entire Western Front in France were taken by both Allied and German soldiers every day. Placing these photos on a map for efficient analyses of how a land- sea- or ice-scape changes over time, however, was impossible, because photos do not record precise locations. 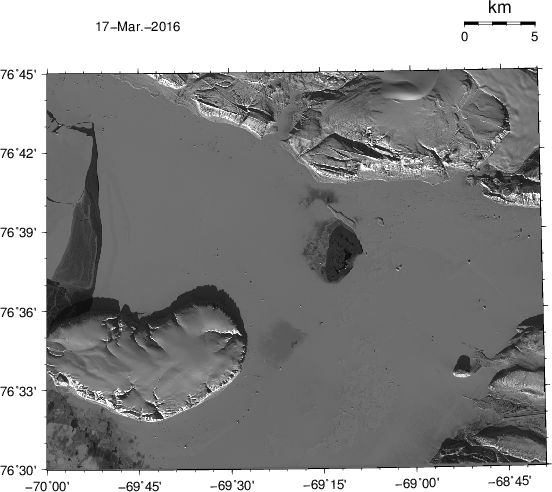 LandSat photo/map of Thule, Greenland Mar.-17, 2016. The airfield of Thule Air Force Base is seen near the bottom on the right. The island in ice-covered Westenholme Fjord is Saunders Island (bottom left) while the glacier top right is Chamberlin Gletscher. 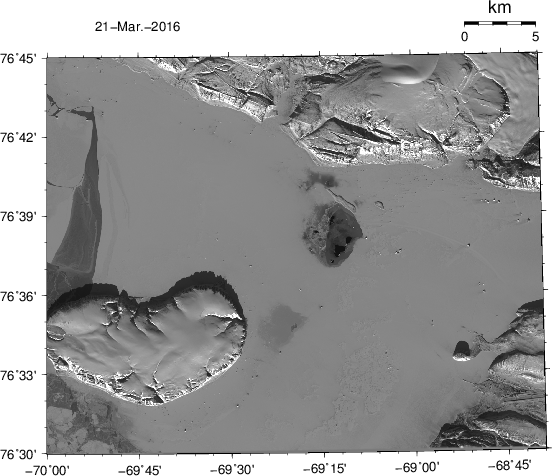 LandSat photo/map of Thule, Greenland Mar.-21, 2016. 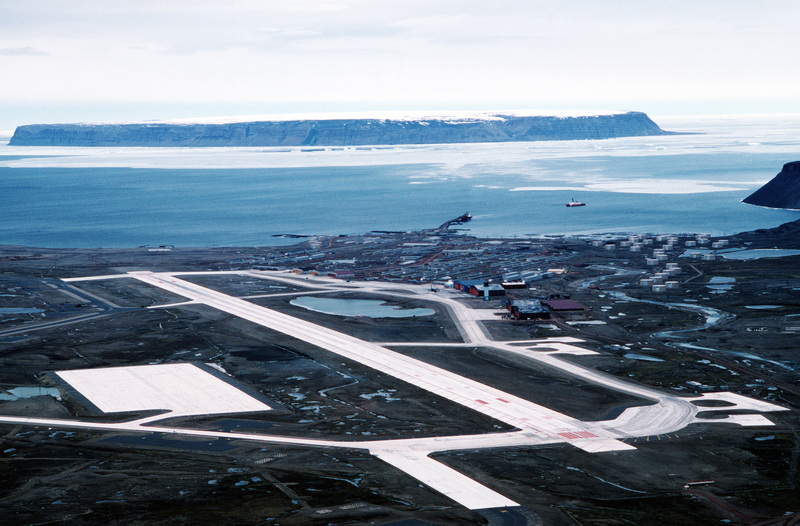 The airfield of Thule Air Force Base is seen near the bottom on the right. The island in ice-covered Westenholme Fjord is Saunders Island (bottom left) while the glacier top right is Chamberlin Gletscher. I am using the satellite data and maps here to plan an experiment on the sea ice of Westenholme Fjord. Next year in March/April I will lead a team of oceanographers, engineers, and acousticians to place and test an underwater network to send data from the bottom of the ocean under the sea ice near Saunders Island to the pier at Thule and from there on to the internet. We plan to whisper from one underwater listening post to another to communicate over long ranges (20-50 kilometers) via a network of relay stations each operating smartly at very low energy levels. We will deploy these stations through holes drilled through the landfast ice 1-2 meters thick. The work is very exploratory and is funded by the National Science Foundation. Wish us luck, as we can and will use it … along with aerial photography that we turn into maps. Is Petermann Gletscher Breaking Apart this Summer?